Take off those glasses and he's STILL A THUG! Hah! 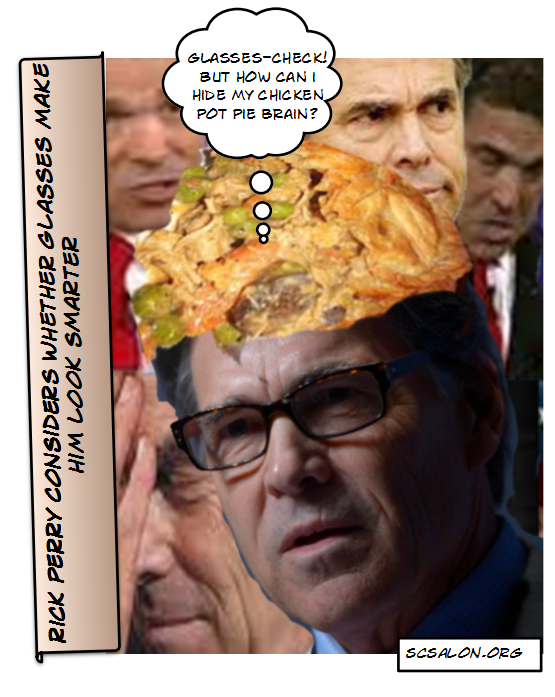 Houston Chronicle snarks at Rick Perry, who continues to be ridiculous. The nationally respected university administrator has been the target for months of several regents determined to get rid of him for not being sufficiently enthusiastic about reform recommendations touted by Gov. Rick Perry. For the past five years, the governor, in thrall to a major donor and former business professor named Jeff Sandefer, has pushed for UT-Austin and other state universities to adopt Sandefer's "breakthrough solutions." The so-called solutions included bonuses for teachers based solely on student evaluations, paying teachers for the number of students they teach and researchers for the number of dollars they attract, among other business-related recommendations. Powers, it seems, wasn't sufficiently enthusiastic. He and his supporters among the UT faculty and alumni feared the recommendations would dilute the university's reputation as a major research institution and could impair the recruitment of top professors. And he wont' attend his impeachment hearing without a subpoena - Also didn't realize he is apparently a large part of the reason Mack Brown retired. Hall, accused of releasing private student information in records he shared with his personal attorney, among other matters, has made the subpoena a condition of his testimony. Hall is accused of requesting thousands of UT-Austin documents in a “witch hunt” to oust Powers and of micromanaging the university, according to committee testimony. Hall said that his record requests were part of his job improving UT and that he followed the advice of UT System officials when handling student documents. Powers remains at the university. But UT football coach Mack Brown announced his retirement on Sunday, citing tension among university leadership as part of the reason for his decision. Earlier in the year, Hall may have broken protocol and circumvented Powers’ authority, and perhaps riled Brown, by facilitating an informal meeting with the agent of University of Alabama football coach Nick Saban to explore whether Saban would consider becoming UT’s coach, the Associated Press reported. The academic tiffs cause us to wonder whether the governor was hoping that his new horn-rimmed glasses would make him look more professorial, if not presidential. Glasses or not, we hope he'll stick with his presidential plans, whatever they turn out to be, and not academia. Both his alma mater and UT-Austin are better off without the involvement of the self-described "little ol' animal science major from A&M." You can make a pig wear a tuxedo, or in this case eye glasses, but it's still a pig.